For other uses, see Gallery (disambiguation). In architecture, a long gallery is a long, narrow room, often with a high ceiling. 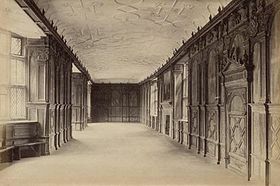 In Britain, long galleries were popular in Elizabethan and Jacobean houses. They were often located on the upper floor of the great houses of the time, and they stretched across the entire frontage of the building. They served several purposes: they were used for entertaining guests, for taking exercise in the form of walking when the weather was inclement, and for displaying art collections. A long gallery has the appearance of a spacious corridor, but it was designed as a room to be used in its own right, not as a means of passing from one room to another. 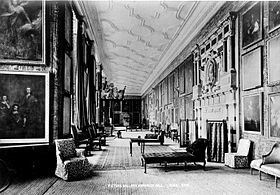 In the 16th century, the seemingly obvious concept of the corridor had not been introduced to British domestic architecture; rooms were entered from outside or by passing from one room to another. Later, long galleries were built in Victorian houses, such as Nottingham Castle. ^ "The Long Gallery". Birmingham.gov. Archived from the original on 26 February 2006. Retrieved 9 September 2013. ^ "Long Gallery". Burton Constable Foundation. Archived from the original on 14 May 2014. Retrieved 13 May 2014. ^ "The home of Charlton House and Greenwich Heritage Centre - Royal Greenwich Heritage Trust (RGHT)". www.greenwichheritage.org. ^ "Haddon Hall, The Long Gallery". Places to Go. David Ford. Retrieved 13 May 2014. ^ "The Long Gallery". The House. Hatfield House. Archived from the original on 28 April 2014. Retrieved 13 May 2014. ^ "Long Gallery". Syon House. Retrieved 13 May 2014. "Gallery" . Encyclopædia Britannica (11th ed.). 1911.